SWITZERLAND, Zurich — Based on breaking news and events, it appears that CIA Headquarters beneath Lake Geneva is preparing to execute a wave of Islamic terror attacks in Norway. The unprecedented attacks will likely be blamed on the state-sponsored terror group known as ISIS which were trained at a secret NATO military base in Jordan. Although the impending ISIS-related terror attacks could theoretically target any number of Norwegian government buildings, landmarks or tourist attractions, Brunstad Christian Church (BCC) and its Oslofjord Convention Center (Brunstad Conference Center) in Stokke, Norway are the most likely targets. A future scenario in which homegrown Norwegian terrorists affiliated with ISIS access Stokke, Norway via boat in order to execute a wave of horrific terror attacks on the Brunstad Conference Center and/or its Youth Exchange Program (YEP) appears to a realistic possibility. Based on the relatively recent yet lengthy history of ISIS-related terror attacks on Christians in Iraq, Lebanon and Syria (see list below), a BCC-related terror attack will most likely consist of beheadings, crucifixions, suicide attacks and/or a lengthy made-for-TV hostage crisis. The notion of terror attacks in Norway was originally witnessed back on July 22, 2011, during the 2011 Norway Attacks which resulted in the death of 77 people, a majority of which died at a Workers’ Youth League (AUF) summer camp on the island of Utøya in Tyrifjorden, Buskerud, just 100 kilometers (62 miles) north of the Brunstad Conference Center. Since the Brunstad Conference Center is located on a fjord which feeds into the North Sea, state-sponsored terrorists (i.e., Special Forces) could theoretically access the BCC’s private property via boat from either Denmark, England or Sweden, all of which have been recently linked to ISIS-related terrorism. The 2011 Norway Attacks primarily targeted the Workers’ Youth League (AUF), resulting in the deaths of 69 young people. Coincidentally, Brunstad Christian Church (BCC) has a year-round international Youth Exchange Program (YEP) in Stokke, Norway which may be slated to suffer the same fate. Based on the location, proximity and method of attack employed during the 2011 Norway Attacks, it appears that the horrific state-sponsored terror attacks were specifically executed by the CIA in order to set the precedent for an attack on Brunstad Christian Church (BCC), namely its Brunstad Conference Center. In other words, it’s not just a coincidence that the 2011 Norway Attacks were: a) executed roughly 100 kilometers (62 miles) north of the Brunstad Conference Center; b) executed in-part using a boat, setting the precedent for a water-based attack, possibly in Stokke; and c) executed primarily against the Workers’ Youth League (AUF), setting the precedence for a similar attack, possibly against BCC’s Youth Exchange Program (YEP). The notion that Brunstad Christian Church (BCC)-related churches and its entities may suffer state-sponsored terrorist attacks was first identified in a Truther.org report from January 10, 2015, entitled, “NBA Terror Alert—Attack on Portland Blazers vs. Orlando Magic Game Trending”. Since many members of BCC’s church in Salem, Oregon routinely work at the Moda Center in Portland, Oregon during Blazer home games, an attack on the NBA arena would result in the death of numerous BCC members. Since the potential terror plot was ultimately exposed, the CIA has evidently greenlighted “Plan B”, an attack on the Brunstad Conference Center. Whether Brunstad Christian Church (BCC) leader Kåre Johan Smith has any first-hand knowledge of the impending terror attacks targeting his church is not known, but he is: a) allegedly of Jewish ethnicity; and b) a rabid supporter of Israel who incessantly advocates Zionism (which Albert Einstein equated with the Nazi Party), so it’s theoretically possible. Historically speaking, Zionists have no reservations about killing their own, so long as a greater political objective is attained. If Kåre Johan Smith is indeed a practitioner of Judaism as alleged, he may secretly study the Practical Kabbalah whose witchcraft often entails demonic blood sacrifices which often entail terror attacks. As many members of the Brunstad Christian Church in Salem, Oregon already know, I, David Chase Taylor (a former member of BCC), am currently seeking political asylum in Switzerland after exposing numerous state-sponsored terror plots (e.g., the 2011 Super Bowl Nuclear Terror Plot, the 2012 Democratic National Convention Terror Plot, the 2014 Super Bowl Nuclear Terror Plot, etc.). Consequently, if I am ever forced to leave Switzerland, I will be disappeared, tortured or killed by the CIA which is coincidentally headquartered in Switzerland. For those wondering why I would apply for political asylum in Switzerland, know this: a) I originally applied for asylum in Switzerland on March 8, 2011, roughly 2-years before I discovered that Switzerland was harboring the CIA; and b) the CIA has historically not shat where it eats in Switzerland. That being said, the CIA has now been exposed for the first time in history. Consequently, they are extremely desperate and may assassinate me Switzerland. Since BCC is a global entity with more than 220 churches in 65 countries, news and information about my case (which is currently under global CIA gag order) has the potential to spread rather quickly. This fact makes BCC a direct threat to Switzerland and its CIA which is exactly why it’s now being targeted. In the event that a BCC church in Norway or elsewhere comes under terrorist attack, the chances that my case for political asylum will receive social and/or financial support from BCC members is far less likely. According to the Norwegian Intelligence Service (NIS), they were warned by an undisclosed foreign intelligence agency on July 18, 2014, that a terror attack against Norway is expected. At approximately the same time, the Norwegian Police Security Service (PST) received word that a terror attack was planned against Norway. Roughly 4-months later on November 5, 2014, a terror threat assessment by the Norwegian Police Security Service (PST) stated that within the next year it is “likely” that there will be terror attacks in Norway. Norwegian Justice Minister Anders Anundsen previously stated that the “terror threat against Norway [has] sharpened“. Most recently, on February 16, 2015, Norway’s Defense Minister, Ine Eriksen Soereide, stated the following in an interview: “No matter what kind of scenario you look at, for the coming years you will most likely have some kind of terrorism situation to consider…This is the new normal, it’s something that we have to get used to now”. Soereide also stated that there are as many as 70 people living in Norway who have fought for ISIS in Syria and Iraq, and that they are now considered a threat to Norway. “That’s quite a high number, considering the size of our country”, Soereide said. It is imperative to note that ISIS, Norway and the other 205 countries of the underworld are under the command and control of the CIA in Switzerland. Consequently, all terrorist-related threats and warnings are premeditatively fabricated in order to create a plausible terror narrative in the media prior to state-sponsored terror attacks that will predictably be blamed on Islamic terrorists. 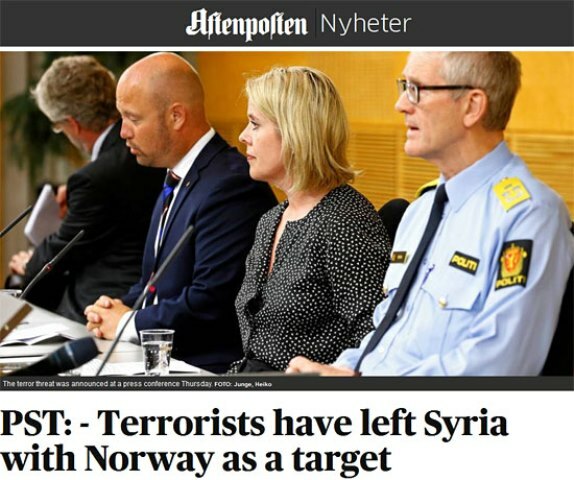 In what appears to be pre-Norway terror attack patsy seeding and programming, it was reported back on July 24, 2014, that 4 ISIS terrorists were their way to Norway when they triggered a terror alert. Exactly 2-months later on September 24, 2014, it was reported that the Norwegian Intelligence Service (NIS) was on alert for 4 more ISIS terrorists on their way to Norway in order to carry out a knife attacks against Norwegian civilians. Although the ISIS terrorists reportedly landed in Athens, Greece, en route to Norway, their current whereabouts are unknown. Roughly 5-months later on February 19, 2015, it was reported that the Norwegian Police Security Service (PST) issued a terror alert through Interpol in respect to a Norwegian woman who has plans to executed a suicide attack at an undisclosed location in Norway. The woman in question is alleged to have traveled to Syria where she received weapons training from ISIS. In order to further highlight the Norwegian woman who has now been missing for 2-months, it was reported on February 19, 2015, that police in Sweden are now helping authorities in Norway locate the woman before she can execute a terror attack. The report is key because it infers that Norway is not capable of handling a single female terrorist itself, making it appear, at least publically speaking, quite vulnerable to a group such as ISIS. Whether the 9 ISIS terrorists targeting Norway will eventually be arrested, tried and convicted for future terror attacks in Norway is not known, but it’s highly likely. In order to make ISIS-related terror attack in Norway seem at least plausible, the CIA-run media must first fabricate the notion that Norwegian-born citizens are actively engaged in ISIS. This particular narrative was first identified on November 19, 2014, when it was reported that two Norwegian ISIS fighters were killed in Syria. 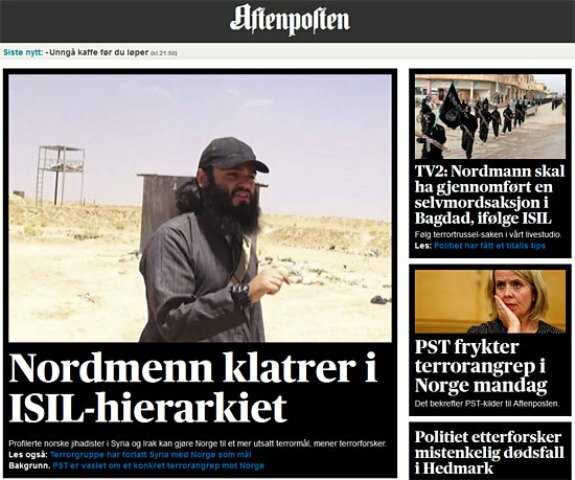 Roughly 3-months later on February 12, 2015, it was reported that Norwegians have now taken command of ISIS, posing a direct threat to Norway. According to Kjell Grandhagen, head of the Norwegian Intelligence Service (NIS), approximately 150 Norwegians are now fighting with ISIS terrorists in Syria and Iraq. “We believe that some of the Norwegians in [ISIS] have risen to middle-management functions…There are still several Norwegians who hold leadership positions in [ISIS].” Grandhagen gave the example of ISIS commander Bastian Vasquez, a Norwegian of Chilean extraction who was reportedly killed in 2014, and an unnamed Norwegian of Eritrean parentage also known as an ISIS commander. Grandhagen also stated that Norwegians fighting for ISIS were radicalized by Profetens Ummah, an extreme salafi-jihadist Islamist organization active near the Norwegian capital of Oslo, roughly 110 kilometers (68 miles) from the Brunstad Conference Center in Stokke, Norway. In the wake of Islamic terror attacks in Norway, Profetens Ummah will have predictably pledged allegiance to ISIS, just as the state-sponsored terrorist group Boko Haram did on March 13, 2015. Aside from the fact that BCC openly supports the Zionist state of Israel, it was revealed back on September 19, 2014, that Norway has officially joined the international military coalition against ISIS. Roughly 6-months later on March 10, 2015, it was reported that an elite Norwegian military fighting force has now entered the battle against ISIS. In the wake of ISIS terror attack in Norway, BCC or elsewhere, one or more of the aforementioned factors will likely be cited by Norwegian military officials and politicians as the motivating factor in ISIS’ decision to execute the attacks. Needless to say, nothing could be further from the truth as ISIS and the Norwegian military are both run by the same entity—the CIA in Switzerland. 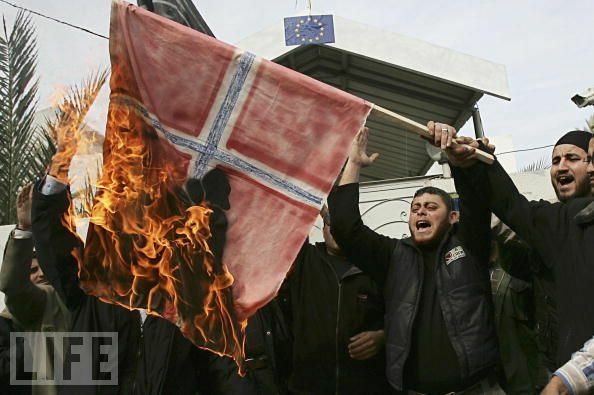 In order to link ISIS to Norway just prior to a wave of state-sponsored terror attacks in the Nordic country, Norway’s first-ever trial of suspected Islamic jihadists commenced in Oslo in February 2015. According to reports, the made-for-TV trial features 3 Islamic Norwegians accused of fighting alongside of ISIS in Syria. The ISIS terrorists have been charged with aiding a “terrorist organization” after allegedly trying to send military equipment to other members of ISIS. In other words, the men are being charged with weapons smuggling, something which would need to take place prior to terror attacks in Norway which has a total ban on automatic weapons as well as terrorist-related weapons and explosives. Predictably, Norwegian authorities “fear” that the ISIS defendants will attempt to execute terror attacks on Norwegian soil. The timely trial is being evidently staged in order to acclimate Norway to Islamic terrorism, as well as to sell the notion that ISIS is organic in nature and not state-sponsored. 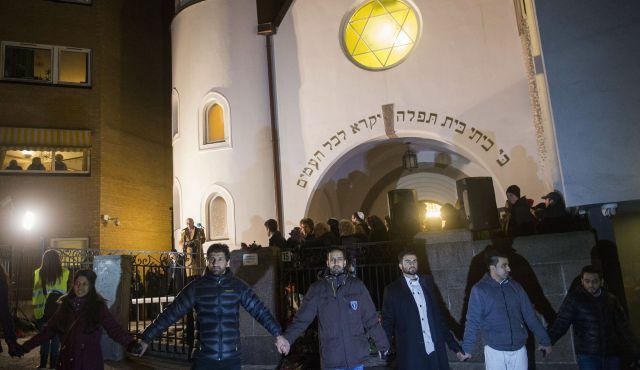 In what appears to be CIA-spawned publicity stunts designed to put an international spotlight on Muslims in Norway just prior to a wave of horrific Islamic terror attacks, it was reported back on February 22, 2015, that over 1,000 people joined in a Muslim “Ring of Peace” outside a synagogue in Norway. Five days later on February 26, 2015, the controversial Iraqi cleric, Mullah Krekar, was arrested in Oslo, Norway on preliminary charges of “inciting to commit criminal offense”. The arrest came after an interview with NRK (Norwegian Broadcasting Corporation) in which Krekar praised the Charlie Hebdo attacks in Paris. In January 2015, Krekar was reportedly freed from an Oslo prison after serving nearly 3 years for making death threats. The 58-year-old Kurdish Sunni Islamist Islamic scholar, who came to Norway as a refugee in 1991, was convicted in 2005 of a similar offense. In all likelihood, Krekar is an intelligence operative who was ordered to make the controversial statements on TV just prior to a wave of ISIS-related terror attacks in Norway. His very public arrest appears staged considering the Norwegian Constitution guarantees the right to free speech. Prior to an ISIS-related terror attack on a global Christian entity like Brunstad Christian Church (BCC), the world must be psychologically prepared to accept that this is in fact possible. Fraudulent headlines and fabricated events are a slick way of convincing people that yes, it can happen. 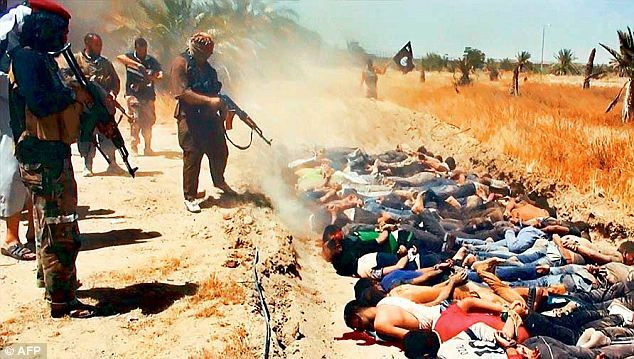 As evidenced ISIS-related attacks, crucifixions, kidnappings and killings of Christians is now at an all-time high which suggests that a state-sponsored ISIS-related terror attack on a Christian-related entity in Europe or North America is imminent. Prior to a high-profile religious-related terror attack, the world must be psychologically prepared to accept that this is in fact possible. Fraudulent headlines and fabricated events are a slick way of convincing people that yes, it can happen. As evidenced religious-related terror is now at an all-time high which suggests that a state-sponsored terror attack on a particular religion (e.g., Catholicism, Christianity, Judaism, etc.) or a religious building (church, mosque, synagogue, etc.) is imminent.